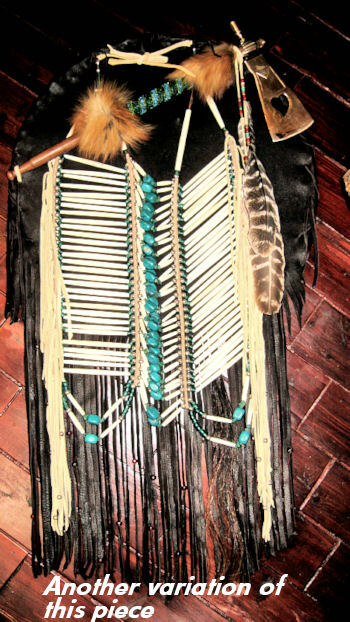 The breastplate contains real buffalo bone or horn beads (shown with both), crystal or semi-precious stone beads (shown with jade), glass crow beads, and brass (shown) or silver beads. In all there are several hundred beads on this piece. The fringe on the breastplate is a contrasting color to the hide used on the shield. 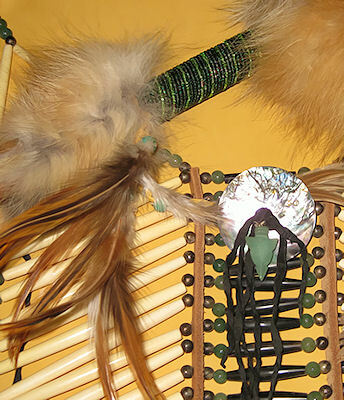 This breastplate is made with long buffalo bone hairpipe beads on the outer rows and short buffalo horn hairpipe beads in the center. If you prefer, we can reverse this or use all bone or all horn. 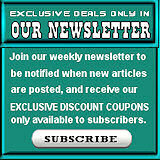 If you have a preference, leave a comment in the comment box of your checkout form. The shield also contains multiple horse hair bundles held on with brass or silver cones and two large barred turkey feathers on the tomahawk handle. There is a large abalone disc in the middle of the breastplate and metal or glass crow beads on the fringes of the shield. The picture shown is representative, the one you receive may vary. No two shields will be exactly alike. The shape of the tomahawk head may be different than the one shown, and the beads used in the breastplate will vary. If you have a preference for specific semi-precious stones or bead colors or want a specific fur, leave a comment in the comment box on your checkout form. Choose your deerskin leather colors and big feathers by stating your preference in the comment box of your order form. This tomahawk breastplate shield can be shipped internationally. If additional postage is required on international orders, we will contact you when your order is ready to ship. Feathers cannot be shipped to New Zealand. However, we can leave the feathers off by request. Current Reviews: 1 This product was added to our catalog on 10/30/2009. I just wanted to let you know your beautiful artwork arrived ..